As a pair of committed romantics, we didn’t expect to find ourselves in counseling together during our first year. This is the story of our path from joint counseling to becoming co-presenters about “Living Tenderly Together” at marriage enrichment conferences. We’ve learned many lessons over the years, and we’re still students of sweetening and deepening our relationship. Our most important discovery is that tenderness together can be cultivated, and like a well-tended garden, it will grow. Six elements of Living Tenderly Together have helped us grow a rock-solid, deeply satisfying and precious closeness. We share these with you below. This is a work in progress. Only five of our planned seven chapters are included here. In addition, some of this writing may be expanded before final publication. SUBSCRIBE to our mailing list if you would like to be notified about updates, including: the availability of the completed book; any significant additions to the text; and our BLOG posts. Our hope and our goal is that you will benefit from exploring the first five chapters even before the final two chapters are completed. With that in mind, the first five chapters will remain available here indefinitely. Ultimately we expect that all seven chapters will be available as a short, inexpensive book you can either download or order in paperback. From our earliest years together, we have been students of what makes a couple’s love endure and thrive, first for our own benefit and then to share what we’ve learned with others. We have been writing about embracing tenderness for many years, and have presented on the subject at marriage enrichment conferences since 1993. Workshops have included: “Beyond Anger: Embracing Conflict and Each Other;” “Tenderness, Fun and Romance;” “Tenderness and Desire;” “Living Tenderly Together;” and more. 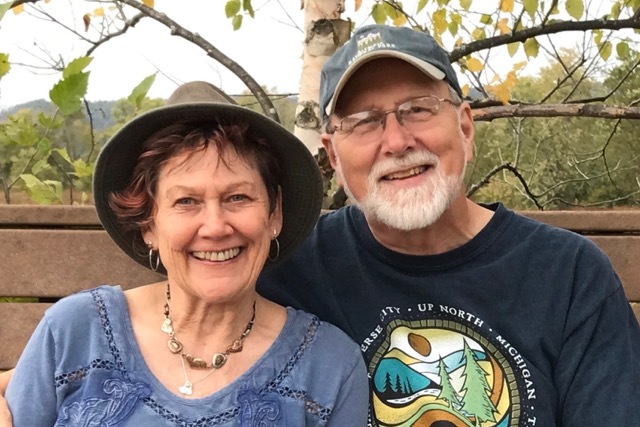 We are now retired (Cheryl was a hospice social worker and Bob was a family mediator) and we’re excited to be sharing with you the essence of what we’ve learned so far about living tenderly together. We plan to include content from our workshops and some original poetry related to each of the topics. In our experience, the secret of our lasting love has been cultivating and embracing tenderness together. To us, tenderness is a gentle and caring sensitivity to each other’s feelings. Tenderness influences how we: honor each other’s feelings; how we tame criticism, anger and blame; how generously and respectfully we resolve conflicts between us; how we celebrate our romance; how we reframe desire and eroticize closeness; and how we take steps to grow together. These pages tell our story about how tenderness has shaped the contours of our closeness. We’ve made plenty of mistakes along the way, but we’ve learned from them and are still learning, at times with the help of others and also from our own discoveries of new ways that worked for us. Eventually our enthusiasm about what we were learning led us to present workshops on six important and effective ways of cultivating tenderness together. Our opening chapter, “Origins: Why Tenderness,” has some background on several of the trials we went through that led us to the importance of tenderness. There’s also an overview of the six elements of living tenderly together, which we call the Six Steps in a Couple’s Dance of Tenderness. The later chapters each focus on one of the steps in the dance. If you’re interested in sweetening and deepening your closeness, and want to solidify your bond at the same time, we invite you to follow us through these chapters. Ideally you’ll be reading this together as a couple. In addition to the potentially useful discussions you can have along the way, you’ll find some exercises that we have found valuable. Coupled or not, reading it together or not, we believe you’ll benefit from learning the skills we describe. We also invite you to visit our BLOG page in the menu above for brief writings that we will post from time to time about topics we think you would find interesting and possibly helpful. If you entered your name and email address, you will automatically receive a link to our new blog posts when they are published. We hope this journey adds more tenderness to your life.